One thing about Europe that I love, is there is a different vibe. You feel it when you walk the streets, visit a cafe or quaint restaurant. It's something that's hard to describe until you experience it. For me, where I stay is part of the experience. Normally back home in North America I find we rent a hotel. It's a place to sleep and shower. Finding accommodations in Europe doesn't have to be hard, or expensive. When I travel to Europe, I like to find a house or apartment and live like a local. I go grocery shopping in the neighbourhood, grab a morning coffee and pastry at the cafe on the corner from my place. The picture you see to the right and above are of one place I rented just outside Koblenz, Germany. I got to stay in the little grey building to the left in the picture above on a 300 year old property. The cost? $73 CAD a night. And that was the most expensive place I rented on my trip. It was a far better experience than staying in a hotel. I was fortunate enough to go on a hockey tour to Europe and wear the maple leaf on my chest. It was a 10 day trip, playing five hockey games in Europe touring Germany, Switzerland, Austria and Italy. I was planning on staying after the trip and touring around for another two weeks. A couple of guys from the team were going three days early to hang out, get over the jet lag, before getting thrust into the first game. My friend asked if I wanted to do that too. We could stay at the same hotel the team was staying at, for $900 CAD for three nights. That didn't include things to do, food, or a way to get around. For $600 CAD we stayed in the place above, rented a car, went to a soccer game, bought groceries, visited a castle, three cities, and paid for gas. Travel win. This post contains affiliate links. Learn what affiliate links are here. Now I have my personal preference on how I like to travel, I'm sure you do to. When I share my travel experiences with people back home, I'm actually surprised how many people feel that a Europe is out of their reach. More so, they don't think they could plan and book something themselves. I actually read once that a great way to boost your mood and destress, is to research and plan a trip. The article said you don't even have to book it, just the process of planning and dreaming brings a lot of joy. Why just dream! Flights are the necessary evil of any trip to Europe. You can be savvy and find that cheap flight, but rarely that game changer of a price. That's where deciding where you stay and how you are going to live, really can make a difference in how long you can stay in Europe.
" Don't be afraid to try something new." Regardless of what you are doing for your trip, do your homework. This will save you a world of frustration, and ensure that your trip goes as smoothly as possible. Whether it is booking a hotel, vacation home, hostel or couchsurfing, you should put the same amount of due diligence into your decision, regardless of what you decide to use. Read reviews, profiles, look at pictures, and check out the neighbourhood. Be an objective reviewer, but don't skim read. I made that mistake one, and it cost me a sleepless night of anger and frustration. Just like you wouldn't just cross a road without looking, you shouldn't book a place without looking at everything. Sure there is risk of having a bad experience, but that is equal amongst all, regardless of which you choose. I've had bad experiences in hotels just the same as in a vacation home. When I took a survival course, our motto was: "Hope for the best, prepare for the worst". This motto rings true for travel. I'm not trying to sound all doom and gloom, but any seasoned traveller will have at least one story where something didn't go as planned. A lot of the issues can be minimized or eliminated by what you do in your planning phase, regardless which of the four you choose. Don't be afraid to try something new. So what should you look for? Depends who you are! Let's look at that next. You probably are a certain type of traveller. Me personally, am a vacation home person. I can generally find the price range I'm looking for matched with the privacy I like as I travel. That doesn't mean I wouldn't choose a hostel or couchsurfing. As for a hotel, the price has to be right, or the situation. For example I had gone to Lithuania towards the end of my trip but my flight was leaving out of Munich. So I just needed a place to stay for one night. I wanted a good night sleep, close to the subway so I could get up and go then next morning. So I found a cheap hotel. Are you a pre-planner or a spontaneous person? Some people like to go where the next day takes them. So for them, hostelling or couchsurfing allows them the freedom to get accommodations on short notice. Vacation homes and hotels may not afford you that luxury. If you are a hotel or vacation home person you will know where you will be each night. Also, if you are travelling with a family, hotels farm stays, and vacation homes are the best option. Couchsurfing and Hostels are more of a social way to travel. With couchsurfing you can stay with a local and get to learn a lot about where you are visiting. Hostelling you can meet people all over the world, maybe find a travel partner. It's really about meeting people. Where to Search for Accommodations? I most often stay in vacation homes when I travel Europe. That doesn't mean I haven't gotten a hotel. Sometimes you just need something for one night and that's where hotels and hostels come in. 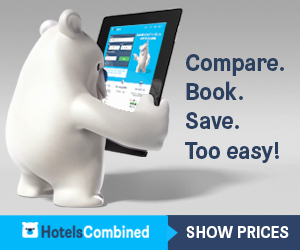 That's why I like using HotelsCombined.com. You can search hotels, vacation homes, hostels and more. It searches all the travel sites, finding you the best deal. If you are looking for a site to book flights and hotel together try Booking.com or Expedia. When it comes to finding places in Europe there are four common options, and four unique options offering a great experience. Hotels can vary in price and amenities quite drastically. Location can really affect the price too. The closer to the "action" the more expensive it can be. The more amenities it has the more it can be. Cheaper hotels will be further away from what you may want to see. Peak season affects pricing too. Try booking a hotel in Munich during Oktoberfest, you'll see what I mean. Finding a hotel in Europe can be just as "fun" as finding the right flight. There are countless websites, such as Expedia, Booking.com, Priceline, and Hotels.com that offer search engines to find hotels. Personally, I rarely use hotels when traveling Europe, but I have used them. Hotels you can book for one night, whereas vacation homes and farm stays, one night probably is not available. Hotels you will be able to find everywhere. Near the city centre, by the airport, out in the countryside. They will have varying amenities and budgets to meet anyones needs. You can find hotels for $45 CAD in cities like Paris. The problem you run into is the location is not ideal. If you don't mind a 45 min train ride each way, each day, then hey, it's a good deal. Generally, hotels tend to be more expensive on average, so if you are travelling on a budget, $150-$250 a night can really shorten a trip. The one thing hotels do offer, is a few standards; bed, TV, bathroom, privacy, security, and often a restaurant on site. Also as a traveller often the language barrier will be less of an issue with a hotel. As for cleanliness, their are good ones and bad ones. Read reviews and you will get a better picture of what they are like. Booking directly with the hotel can save you money, but not always. I randomly picked a hotel near the city centre of Paris. In this case direct with the hotel was not the cheapest, even when their site said, "You get the best rates, as there is not middleman, you are on the hotel website." I always think it is worth a phone call to the hotel for a better rate. They should match what you find online at least but always make sure you are on the actual hotel website. As you can see from the map above the hotel options in an urban centre can be endless. Most sites will have a map to help you see the options. Then use the website filters to narrow your search in the area you are looking to stay in. Look how much the options diminished when the price was filtered for $130< CAD a night. Using the filter can make things a lot clearer. In any accommodation never take for granted your belongings are save just because your door locks. Always take precautions to protect your valuables. People will be in your room to clean it, so keep things out of sight, locked in your suitcase or in a hotel safe if it is available. Always read reviews on the hotels, and read about the area where the hotel is located. Doing your due diligence will ensure the safest stay. Vacation homes have been around in Europe for a long time. In North America the concept is becoming more popular with the advent of websites like AirBnB, Wimdu, and Vrbo to name a few. I find the mentality of vacation homes in Europe different. People there seem to put up their places for rent as a necessity, due to the high cost of living in some places. There are typically two types of host. Those who own properties as income properties, and those who rent out a portion of their home, to help subsidize the high cost of living. Is one better than the other? Not really, I've experienced both, and have had positive experiences in both. I've used vacation homes on every trip to Europe. I love living in a local neighbourhood. It allows me to grocery shop, cook my own food, and experience a neighbourhood. Vacation homes can really vary in selection and price. Location wise they are everywhere. The exciting part is, you can rent a castle, windmill, houseboat, treehouse, and much more if you want a truly unique experience. "The flat is located in very central neighbourhood with many little bistro and cafes around, we could even walk to see some main touristic spots." Sounds pretty ideal doesn't it? So four nights here versus one night in the hotel for the same price. One thing to be aware of, is that some places charge per person, or have an extra fee for extra people over two for example. So make sure you enter how many people. Also you can rent an entire place, private room or shared room. So again, ensure that you check your filter or read carefully what the place is offering. A lot of places have a discount for longer stays also. So it can actually be cheaper than the initial price listed. There are some extra fees to be aware of. They also vary from city to city and place to place. Here is an example. The place is $53 a night. Some place (like this one) charge a cleaning fee. The service fee is from the website (everyone wants their cut). The government, in this case France, wants $3. Add a person, and the Occupancy Fee goes up to $7. So keep an eye on these things. Still, this place after everything is said and done is $66 CAD a night. What is also nice, is that your money stays in escrow, until after your trip and then the host gets paid. So the websites take care of the money, which is better for the guest and host.This adds some piece of mind for both. Each individual host will have their own cancelation policy. So be sure to know what it is, and how it could affect you if you do have to cancel. There is always a chance that the reviews can be all friends of their's right? The websites do their very best to ensure that this doesn't happen. The way the review systems work on a lot of sites is, you can't review until you've stayed there and your trip is over. So you have to have booked and stayed. The host also can do a review on you as a guest. This helps you develop a (hopefully good) reputation as a guest, making it easier for you to rent in the future. This is why I have that 7-10 reviews rule. I guess someone could go through the trouble of having seven of their friends make an account, book with them, then write a review, but not likely. The more reviews the better. Just read them all, it is very important. For an in-depth look at renting a vacation home check out my blog post. It's like a Vacation Homes 101. Read it here. What about security? My friends thought I was crazy when I was first started AirBnBing. They always joked that I would wake up in a bathtub of ice with my kidneys missing. This was their insecurity with the concept. I never once felt unsafe. Are you safe, are your belongings safe? You are renting a place off a stranger after all. I've probably been walked in by hotel maids more times than I'd like to remember. Once I was in my vacation home, I never saw my host. They always respected my privacy. Reviews will give a very good indication on what the host is like. READ ALL THE REVIEWS. My personal rule is I don't rent any place that doesn't have at least 7-10 reviews. That should give you a good indication on what the host is like. If rented a place in Graz, Austria. The reviews talked about how the host lent people his cell phone for their stay, lent them a bike, etc. I got there and asked if there was somewhere I could wash my clothes. He did my laundry for me. That was just the type of person he was, and his reviews showed it. Another place was the perfect price, perfect location, but the reviews talked about the uncleanliness of the place, review after review. I didn't rent it based on the reviews. Hostels have also been always been best known for a cheap way to travel the world. Generally younger people tend to use hostels, but that shouldn't stop you from trying one, even if you young at heart. Hostels are a great way to meet travellers from around the world. Some people make friends that they tour that city with, or meet up somewhere else down the road. Hostels have a great sense of community that makes for a great travel experience. This doesn't mean you have to be social if you don't want to be. There are common areas in hostels which make for a great social environment, such as the lounges, kitchen, and bars. In the dorm rooms, generally people will leave you be. That being said, a good set of ear plugs and eye cover are a must, as it can be loud in some places and people come and go at all hours. I listed one to two people for hostels, but you can travel in larger groups. It just may be harder to get a bed on shorter notice. That is one of the advantages to hostels is that you can book a day or two before. So it depends on your travel style. You can get rooms for up to eight people. Generally rooms are dorm rooms, but private rooms for one, two, four and eight are also available. They will just be more expensive. You likely may have to share a bathroom at most hostels. Shared kitchens can also be available, so you can cook those Ramen noodles you bought. One of the best sites to use is Hostelworld.com . You can even book one or two days in advance, depending where the hostel is and how busy it is. Personal security shouldn't be a big concern as there is a lot of traffic at all times. Often hostels require a passport to check in, helping in security. That doesn't mean things can't happen. Be a smart traveller, and if you get a bad feeling when you are there, leave. 90% of hostels will have lockers, so use them! You will have to provide your own padlock, so make sure you buy one in advance. Don't go flashing your valuables around, and lock things up. Take valuables with you during the day if you can. Reviews are your best friend once again for finding out what the hostels are like. Bed and Breakfasts have been around for a long time. They generally are family run, which makes for a wonderfully friendly stay, where you are really well looked after. You will feel like true guest, not like a number in a hotel room. They will have common areas, like quaint little lounges, sitting rooms, dining rooms or bars. Here you can meet other travellers and learn about their travel experiences, maybe even about something you never thought to visit. B & B's can be found in cities and rural alike. The real advantage to B & B's is that you can find some of them in smaller rural communities, allowing you to explore the countryside in that area. Of course, as the name implies breakfast is included in your stay. According to bedandbreakfast.com, Italy (5255), France (2389) and the United Kingdom (5007) are the most common countries to have B & B's. They are in other countries also, but are not as common, for example, Finland (3), Denmark (55), Netherlands (152). Prices can vary, from about €40 to €190 a night. They may be harder to get to, in particular the rural locations, so you may have to rent a car. How would you like to stay in a beautiful Chateau in France? This is what you can find with B & B's. Again like anything, always read what the place will offer. All are independently run, so what they offer will be very different from place to place. Read reviews, and when you do you will often read about the owners, referred to by name, because that is the type of experience you will have. You will be treated like a house guest rather than a renter. Your experience here will have leaving feeling like family. Personal security should never be a concern, along with your personal belongings. Again don't leave things lying around. These places are run by families often, and this is their livelihood. To steal from their patrons would be business suicide. They are small businesses with a few rooms to rent. With the internet today, a couple bad reviews could make their business suffer. So you can expect a really pleasant experience. Always read reviews on the Pension Hotels, and read about the area where the hotel is located. Doing your due diligence will ensure the safest stay. Pensions are an interesting option. They are found all over Europe, but Central and Eastern European cities seem to have the most. They are like a cross between a small hotel and B & B. They are a little harder to find on the internet as there are no dedicated sites for Pension Hotels. They can be found in regular booking sites, but they are in with the regular hotels. Pensions often offer breakfast, and potentially other meals. They may have a restaurant so to speak, that is only available for the guests and not the general public. They may have private bathrooms and shared bathrooms. For example it may cost €29 for a single room with a shared bathroom, and €59 for a single room with a private bathroom. Another thing to be aware of is that they often charge per person so be careful what you book. So a double room may be listed at €26, but that is per person, making it €52 per night. Often it is best to book directly with the Pension. These are often privately owned. Their website can be very limited with on information and often are in the local language. So look to see if they have an English version or use Google to translate the page. The easiest way to find a Pension is to type "Pension Hotel (City Name)" It should bring up a map, and you can click on it. Then on the left it will list the Hotels and on the right you can look at a map with prices. If you click on the hotel name on the left it will pop up a window giving you the option to go directly to their website. Just be aware that Google translating a site, may not be a good translation. So For example "links" as used in english on a website means links we can click. A German website would use the English word for "links", but Google would translate it thinking it was a German word, which is "left". A lot of these sites don't have a way to book online, so you may have to call or email them. You can often save 50% versus a hotel in the same area, so this might be worth looking into. A farm stay can be a great experience in any country. This will give you a unique but affordable place to stay. My family and I stayed on dairy farm in Bavaria. In our stay we just had an apartment and didn't partake in the farm activities. Some farms will let you get your hands dirty and help with harvesting, feeding of the animals, maybe even have special cooking lessons. On a rainy day we spent a half day learning about the dairy farm, which was fascinating. Many farms will be more like a B & B or Vacation Home. So it may be a nightly rate per person, or a weekly rental rate. Farms can be found all over Europe but the most popular places are the U.K., Italy and Spain. Farms are also great rural places to set up a home base from, provided you have a car. With everything being so close together in Europe, you can settle down on a farm and each day explore a different place. This can be better than trying to get out of a big city in traffic. You can still visit the big cities by driving to a park and ride just outside the city and taking the train in. This will save you the nightmare of driving and parking in a major centre. You can take the train right to the city centre stress free, then come home to the serene country setting. What's not to love? If you are travelling with children, this is a fantastic way to create a memorable trip. As much as they will love touring the churches of Europe and learning about Gothic architecture, feeding a cow or some chickens may be just as exciting. Wouldn't you rather they run around a pasture in the evening than asking for the iPad? Personal security should never be a concern, along with your personal belongings. Again don't leave things lying around. These places are run by families, and this is their livelihood. Read reviews, they may be harder to find, but they should be out there. In the prime summer months in Europe, hotels rates are higher than in the off season or shoulder seasons. At the same time there are beds sitting empty. Universities are out for summer and most of their students have gone home for the summer. Some of the universities rent out the dorm rooms to travellers. Each university has different options. Some will have double dorm rooms with a shared bathroom. Others may have fully furnished apartments. Meals may be provided in some places, and possibly access to other facilities like their gyms. These rooms generally become available roughly in late May to early June. If they have low enrolment, then rooms may be available year round. Rooms won't be anything fancy, will probably be small, and don't get treated very well throughout the year. The advantage is that they often are centrally located, and much cheaper than a hotel during that peak season. If you are in a single or double room that locks, your things should be fairly secure. Taking any valuables with you when you leave is always good practice. In the summer months there can be less traffic, less security, less people to question anyone digging through your stuff, if it is left unattended. Be diligent at protecting your things, like you would anywhere else. Ask if they have lockers to lock up your valuables if you need to leave them there and bring a lock. Couchsurfing is a very interesting concept. The name can be a little misleading. There are more than couches to be had. Basically people offer up what they have available. It could be a couch, futon, spare room, or an air mattress. This is definitely a more social way to travel as you live with the host in their place. What's unique about this, is it's generally made up of a community of travellers. The idea is, that if you are looking for a "couch to surf" so to speak, you would offer up your place the same for travellers coming to where you live. This is what makes it work. The benefit being, it's free. When you look at vacation homes you can also rent a room from someone for a cheaper price than having the whole place yourself. You would be living with them no different than in this. What is different is that an AirBnB, for example, will have pictures of the place and you know what you are getting. Also because you are paying for it, you generally are guaranteed getting a clean place (more often than not). With Couchsurfing you often don't know what you are getting until you get there. I would personally choose an AirBnB for a longer stay, whereas Couchsurfing might be better for a night or two. What people rave about, is the community of people and how you get to know a place better because you have a local to be a guide to the city. You really get to know the culture and people talk often about making great friends. Here's a video from the Couchsurfing website describing what it's all about. When looking for a place you would first need to create a profile on the site. Then you can look for places that are being offered in the city you plan on travelling to. People will be listed for that city that have their place available. You then can contact them and they decide whether they will accept you. The other alternative is you can make a "public trip". You have to have at least 50% of your profile completed in order to set up a public trip. Setting up your profile is really about letting people know who you are and what you are about. People want to get to know who they potentially will host. A public trip allows people to invite you to their place. They can see that you are coming to their city on such and such date, and basically put their hand up and say, "I'll take you!" Understandable people may be concerned about safety when it comes to this concept. You are staying with strangers. Again I would apply the 7-10 review rule here. Make sure they have at least 7-10 reviews to get an idea who you are potentially staying with. If there are more, READ THEM ALL. If you go looking online for people's negative experiences with this, you will find them, just like any of the other places, like hotels, or vacation homes. I recommend going on YouTube and listening to experienced Couchsurfers give their accounts good and bad. You will soon learn that there is a lot of good out there, and the bad were often preventable. Bottomline, if you get a bad feeling when you staying anywhere, leave. The Couchsurfing website addresses safety, you can read about it here Couchsurfing Safety Basics.